Parts of the world seem to be into the second generation of "colour revolutions" such as the Malaysian yellow "Bersih" protests above and the Lebanese "you stink" movement. Among the interesting thing about both cases is that they defy the simplistic characterizations that were imposed on the first generation, which tended to be seen in terms of whether they were somehow aligned with USA interests, which therefore became a basis for assessing whether they were legitimate or not. By the time the Arab Spring rolled around, incumbents had calculated that they could shoot and win, or at least not lose. So good luck to the latest incarnation of the phenomenon. The stark consistency of contemporary history tells us several things as we ponder why the Iraqi military is proving to be so inept in its war against Islamic State. First is the immutable tenet that wars are human endeavors and that culture counts. Arab culture is based on family, tribe and clan. Thus it should come as no surprise that Arabs fight best in formations that are organically grown and organized around familiar groups that share more than the same national flag. Such units fight best on the defensive. Knowing the soldier next to you stiffens your resolve to stand and fight, but helps much less amid the confusion of an offensive advance. The fact that the small Iraqi army garrison at Ramadi, manned by the best of the Iraqi regulars and regionally recruited militias, held on for more than a year against Islamic State is testimony to the strength of a defense based on close tribal ties. Yet Arab militaries can be victorious on the offensive given certain prerequisites, which we saw in the successful Egyptian attack across the Suez Canal during the 1973 Yom Kippur War. They must achieve and sustain overwhelming dominance in firepower. Their method of attack must be well rehearsed and methodical. Their offensive campaign must have very limited and straightforward objectives, which can be achieved quickly by following a carefully scripted and tightly controlled battle plan. Fewer than a hundred U.A.E. troops and their unmarked armored vehicles landed in a small fishing harbor on the outskirts of Aden in July, according to Emirati officers who participated in the operation. This secretive intervention prevented the Houthis from overrunning this port city, which had a prewar population of 1.5 million. Thousands of additional U.A.E. troops, with their fleet of tanks and Apache combat helicopters, arrived in the weeks that followed. They have since pushed the Houthis out of the city and seized most of the two neighboring provinces. The ground operation, which Saudi Arabia has joined, is the biggest by Sunni Arab states against the growing influence of Shiite Iran since the Arab Spring began. As the latter article explains, invading Yemen doesn't fit the criteria of an easy operation that can be achieved with overwhelming firepower permitting a quick exit. But the UAE -- 7 emirates under a single flag -- is showing that as Arab armies fight more and more wars, they are, like other armies, getting better at it. Of course, money helps. The broader point is that the old assumption that the Gulf militaries would be too timid to do anything with USA backing is dead. They can, and they are. How can the same thing happen to the same guys 8 times? Global central bankers are preparing to converge this week in Jackson Hole, Wyo., with a new economic mess on their hands. Do any of these central bankers ever wonder why they have to meet year after year in various resort locations to discuss a "new" economic mess related to the functioning of financial markets that has somehow landed in their laps? His Highness Sheikh Mohamed bin Zayed Al Nahyan, Crown Prince of Abu Dhabi and Deputy Supreme Commander of the UAE Armed Forces, telephoned British Prime Minister David Cameron last night to inform him that the UAE Armed Forces operating in Aden had reached the location in Yemen where UK citizen Douglas Robert Semple had been kidnapped by the terrorist Al Qaeda organisation. During a military intelligence operation, the UAE forces had freed Mr. Semple, taking him to Aden from where he was flown on a UAE military aircraft to Abu Dhabi. Is anyone in the European intelligence/security apparatus actually working in August? The owner of Atlantic City's former Revel casino blames giant seagulls for smashing windows in the vacant gambling hall. Glenn Straub said on Friday that "the biggest seagulls I've ever seen" routinely smash into the glass-covered exterior of the building, which has been vacant for nearly a year. Revel is the casino that NJ governor and presidential candidate Chris Chistie thought was a better bet than new rail tunnels under the Hudson River. Gen. Martin Dempsey, the chairman of the Joint Chiefs of Staff, said in an interview with The Wall Street Journal that three key Islamic State military leaders in Iraq were killed there in recent weeks during operations that are part of an expanding coalition effort ahead of a planned offensive next year. Between Dec. 3 and Dec. 9, American airstrikes killed Abd al Basit, the head of Islamic State’s military operations in Iraq, and Haji Mutazz, a key deputy to Abu Bakr al-Baghdadi, the leader of the group, officials told the Journal. Austerity is just another word for free market, and the harsh debate around it is actually about whether the economy should operate freely again, or continue to drift toward a state-driven model. While undervaluation of the Renminbi was a major factor causing the large imbalances in the past, our assessment now is that the substantial real effective appreciation over the past year has brought the exchange rate to a level that is no longer undervalued. However, the still-too-strong external position highlights the need for other policy reforms—which are indeed part of the authorities’ agenda—to reduce excess savings and achieve sustained external balance. This will also require that, going forward, the exchange rate adjusts with changes in fundamentals and, for example, appreciates in line with faster productivity growth in China (relative to its trading partners). On the exchange rate system, we urge the authorities to make rapid progress toward greater exchange rate flexibility, a key requirement for a large economy like China’s that strives for market-based pricing and is integrating rapidly in global financial markets. Greater flexibility, with intervention limited to avoiding disorderly market conditions or excessive volatility, will also be key to prevent the exchange rate from moving away from equilibrium in the future. The IMF put enough CYA clauses in there to handle various eventualities, but abruptly devaluing by 2 percent because the economy is getting weaker, is still not consistent with it. UPDATE: The IMF issues an anodyne reaction to China's move which never acknowledges that their previous assessment is defunct, and Paul Krugman provides a sense of what's actually happening. “The reporting obligation is driven by the fact that beginning May 1st, 2014, Ireland is Airbnb’s home base for transactions outside the United States. This will be an ongoing part of our annual corporate filing obligation in Ireland,” the company said. Interesting about this case is that while the company probably sees overall tax advantages to being located in Ireland, this tax arbitrage is usually invisible to Irish people because they are not getting any income from most of the multinationals that locate here. For once, the income the country derives being an advantageous corporate base doesn't seem like free money. Former Leinster rugby player and businessman Paul Hennebry has exited National Asset Management Agency (Nama) by refinancing his loans through the mezzanine fund backed by Cardinal Capital and Wilbur Ross, the Sunday Independent can reveal. Hotelier Hennebry, the president of Terenure College rugby club, is now on the verge of acquiring the Citi Hotel beside the Central Bank on Dublin's Dame Street with his brothers Michael and Barry, with the transaction set to close next week. ... Cardinal is the brainchild of Nigel McDermott, who founded National City Stockbrokers with financier Dermot Desmond, and Nick Corcoran, a founding director of Zurich Capital Markets. As well as the joint venture with Ross, it has another joint venture with US asset management giant the Carlyle Group, which is designed to invest in Irish SMEs - both north and south of the border. That fund has invested in chocolate and dessert maker Lily O'Brien's, meat and ready-meals company Carroll Cuisine, and payments business Payzone. Work through the list: Celtic Tiger project started by ex rugby player, on prime site next to Central Bank, taken over by state bad loans agency during the property crash, but now control regained by the original developer helped by veterans of the Irish financial sector with enough links to major US investors to mobilize capital and capacity. It's almost as if the Irish property crash never happened at all! Sunday Independent, Eoghan Harris -- Field's coffee shop in Skibbereen is the place to take the national pulse. RTE Business news -- Minister for Communications Alex White will turn the sod today on a new high-speed digital hub in Skibbereen, Co Cork. The hub in the centre of the west Cork town will have 75 separate workspaces, and when it is up and running in November, it will have the fastest broadband connection in Ireland, provided by Vodafone. Vodafone CEO Ann O'Leary, Glen Dimplex CEO Sean O'Driscoll and Discovery Channel Europe President and Managing Director Dee Forbes are on the steering group. They all have strong ties to west Cork and have homes in the area. Genuine good luck to west Cork in finding sources of jobs besides seasonal tourism, but the odds that a development policy picked on the basis of sounding appealing to its summer swallows is a good one are not high. So his alternative involves the US pursuing "diplomacy" with partners that it would be sanctioning for their own sovereign dealings with a sovereign Iran. 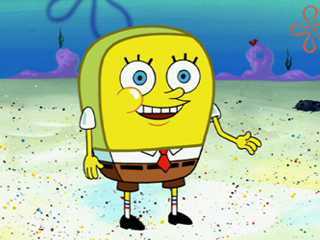 Above, via Spongepedia, the "normal" Spongebob Squarepants. Incidentally, the Krusty Krab isn't unionized. To me, you terminate the deal on day one, you reinstate the sanctions authorized by Congress, you go to Congress and put in place even more crippling sanctions in place, and then you convince our allies to do the same. This is not just bad with Iran, this is bad with ISIS. It is tied together, and, once and for all, we need a leader who’s gonna stand up and do something about it. For the Republicans, that's normal. Many Syrian opposition activists say they have been engaged in talks with the US for months over this. “In March they asked us to give them lists so they could study the training and the number of fighters,” said an activist from Deir Ezzor, a province in eastern Syria controlled by Isis. “We sent by email a list consisting of 200 fighters as a start. Up until now we haven’t got a response.” After months of waiting, US officials finally contacted the Deir Ezzor activists last week and asked them to send a new list. But activists said they would struggle to provide the names of willing volunteers, because most on the earlier list were now partnering with Salafi Islamist groups unpalatable to the US. Such groups include Ahrar al-Sham or the Saudi-backed Jaish al-Islam. Note in particular that the screening process excludes the most effective anti-Assad fighters! King Salman arrived in France last weekend (July 24) for a three-week stay, bringing with him no fewer than 1,000 people from his entourage who will stay in his huge villa in overlooking the Mirandole beach or in nearby hotels. Above, King Salman arriving today in Tangier, Morocco, one week after his arrival in France for a three-week stay. They [the rich] consume little more than the poor, and in spite of their natural selfishness and rapacity, though they mean only their own conveniency, though the sole end which they propose from the labours of all the thousands whom they employ, be the gratification of their own vain and insatiable desires, they divide with the poor the produce of all their improvements. They are led by an invisible hand to make nearly the same distribution of the necessaries of life, which would have been made, had the earth been divided into equal portions among all its inhabitants, and thus without intending it, without knowing it, advance the interest of the society, and afford means to the multiplication of the species. When Providence divided the earth among a few lordly masters, it neither forgot nor abandoned those who seemed to have been left out in the partition. These last too enjoy their share of all that it produces. In what constitutes the real happiness of human life, they are in no respect inferior to those who would seem so much above them. In ease of body and peace of mind, all the different ranks of life are nearly upon a level, and the beggar, who suns himself by the side of the highway, possesses that security which kings are fighting for. Quote from Metrobank founder Vernon Hill in an interview with Stephen Moore for the Wall Street Journal ($). It has everything: the phony outrage, the prospect of cleavage, and Manchester United. Bravo!